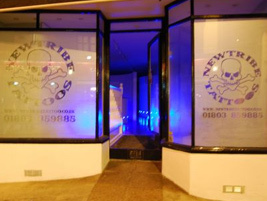 Established in 1997 by Tattooist Adam Harris, New Tribe started out as a typical Tattoo Studio, It had one Tattooist and one body piercer, Mainly offering flash work, walk-ins and appointments. Over a decade has gone by since then and New Tribe has evolved immensely. Today New Tribe is an award winning Studio, owned by Adam and his wife Zoe, now has 3 artists including Adam. Take the signs towards Torquay. At the English Riviera roundabout follow the signs towards Paignton. At the ring road follow the signs towards Brixham. When you follow the New Road into Brixham, take the lane towards the right and we are on the left. Take the signs towards Paignton via Totnes. At the tweenaway crossing follow the signs towards Brixham.